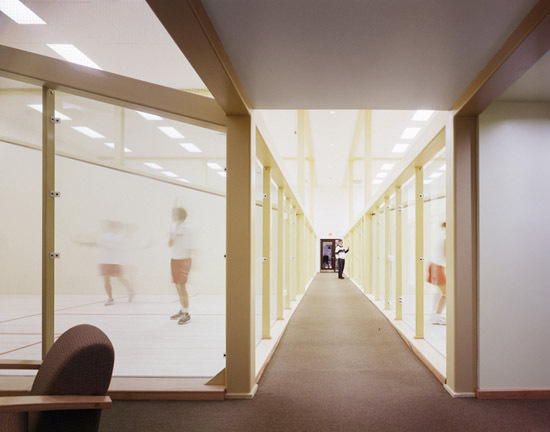 The project involved the conversion of eight squash courts into six International Regulation courts. Since the courts were within the larger Smith Swim Center, it was necessary to isolate the courts from the pool area to provide constant humidity and temperature throughout the year. The cell-like cinder block courts and an upper walkway were demolished to create an open, loft-like space framed by steel tubular columns. A small viewing lounge was carved out of the remaining space, with a glass common wall looking into one of the courts. 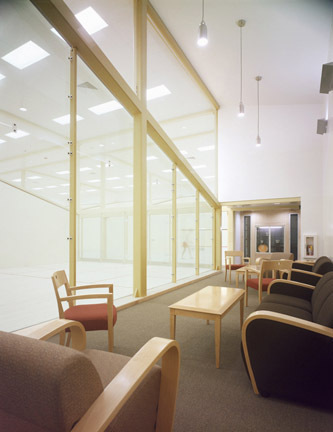 Glass doors provide a physical separation while visually connecting the two activities of swimming and squash. The glass-lined corridor provides a new pathway to and from the natatorium while celebrating the many diverse activities under one roof.